There is an old saying in Japan, “There are ten thousand ways to make sake.” CBC is very proud to introduce number ten thousand and one. 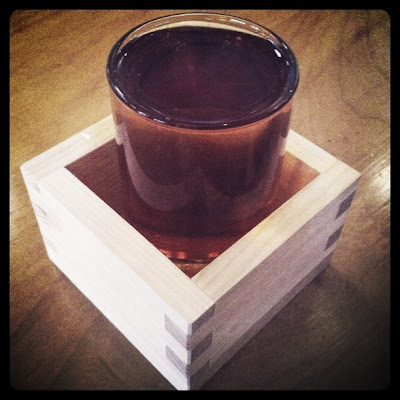 Banryu Ichi (10,001 ways in Japanese) is an experimental brew that straddles the line between beer and sake. Produced in collaboration with our good friend and masterful sake home-brewer, Todd Bellomy, this has been one of the most interesting and labor-intensive beers ever to come out of CBC. We began last December by spending many cold, windy days in the alley behind the brewery, steaming rice in small batches to brew what became almost fifty gallons of pure sake. Sake is produced by multiple parallel fermentation: polished rice is converted to sugar by a fungus called Koji (Aspergillus oryzae) and fermentation is taken care of by sake yeast (Saccharomyces cerevisiae kyokai). After several weeks of fermentation this batch of sake (possibly the largest batch of sake ever made in New England) was destined to become the starter for our beer. Just after Christmas, Todd joined us again to brew a mere six barrels of the craziest beer wort ever. Pale barley malt and flaked rice went into the mash, and after extracting only the first runnings we added a significant amount of brown rice syrup. This yielded a wort of 31*P / 1.124 SG, or in other words, some really thick, sticky stuff! The wort was sent to the fermenter and then, with fingers crossed, we pumped over the entire batch of sake including the yeast, Koji, and lots of rice slurry. Fermentation was slow and low at 50*F for six weeks, followed by cold-conditioning until it reached more than 15% abv! Incredibly complex aromas and flavors abound, including sweet rice, fresh apples and grapes, hints of earth and mushroom from the koji, and as it warms further notes of fennel, herbs, and an almost Belgian-yeast spiciness. Brilliant copper-colored, it is full in body despite its very dry finish. This is one to be sipped, savored, and contemplated. Banryu Ichi is a truly unique beverage, served with intentionally very low carbonation in a 5oz. glass set inside aMasu, a traditional cedar sake cup. Wow, this just sounds insanely interesting. The 1.124 OG of the beer alone is enough to gasp at, let alone the fact that it was blended with sake! Adam reports "it's sweet with a nice fruity, grape-like flavor, and despite the high ABV, it's very drinkable." Anyone else out there had this one? Today we feature future professional brewer Robert Olson's Wee Heifer's Fruitcake beer. Bob is a homebrewer of the finest kind, poised to go pro with his many fantastic brews. You will be seeing his beers in stores sooner than later, methinks. This beer you won't want to re-gift pours a dark brown with a nice, receding head. From the aroma you get a nice balance of malt and fruityness. I let it warm for a little while and there's almost a barleywine character going on. When you taste it, you get a complex mix of fruits, with the figs at the forefront, giving it a bit of a nutty flavor as well. As you continue sipping, you also detect the cherries and raisins. Turns out that what I thought was a barleywine character actually comes from the fact that this beer was bourbon barrel aged! Awesome. Keep up the great work Bob. For more info about Bolero Snort, check out their website, facebook and twitter! This week's User Beetography comes to us from Chris Mare. Chris recently visited the Captain Lawrence Brewery in Pleasantville, NY and came away with the Smoke From the Oak Gift 3-pack with tasting glass. Here he has photographed the Wine-Barrel aged version in his brand-new matching Capt. Lawrence glass! Got a good shot you took while imbibing this past week? 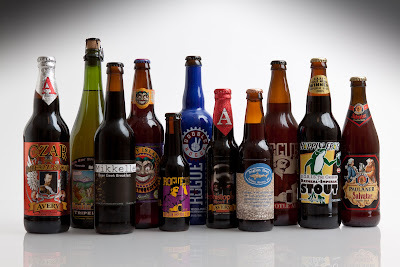 Send it to beertography@gmail.com to be considered for next week's Beertography of the Week. The goal for 21st Amendment here was to brew a hoppy yet sessionable beer. They liken this new creation as "the antidote to the to the strong, dark, intense beers of winter". And it seems they've succeeded. It pours a bright and clear, crisp amber with an aroma dominated by hops. Hello, Simcoe! Oh yeah, Centennial too. Upon sippage, you'll notice how light the body is. But just enough hop bitterness is there to balance it all out. Wow, this is one of the better session beers I've ever had, and its only 4.4% too! It's apparently a late-winter release only, but I'd love to crack some of these open on a hot day by the pool. 21st Amendment currently distributes to 15 states: California, Oregon, Washington, Alaska, Idaho, Minnesota, Ohio, Massachusetts, New York, New Jersey, Washington, D.C., Maryland, Pennsylvania, Virginia and Georgia. This week's User Beetography comes to us from John Manfred from Alabama. The photo is entitled "Three Amigos" and it features Naked Pig Pale Ale, He'Brew Bittersweet Lenny's R.I.P.A. and Great Divide Hercules Double IPA. Thanks John for the submission! 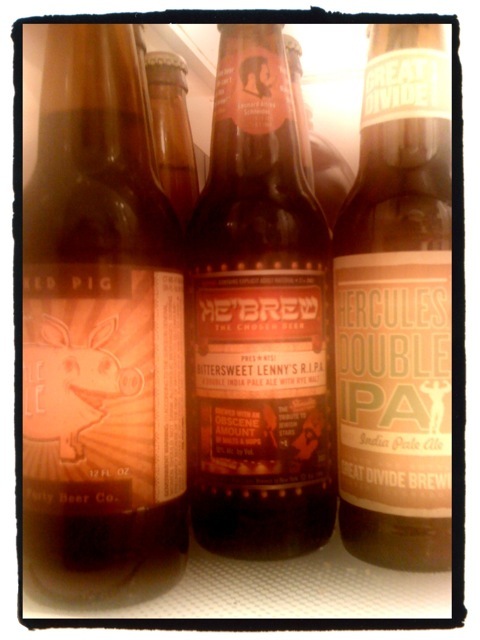 Keep those beer photo submissions comin' to beertography@gmail.com. HAVE YOU HAD THIS BEER? Ballast Point Victory at Sea is described as a "Coffee Vanilla Imperial Porter". Its new to the NY/NJ market, but I had the chance to get a sneak peek of it when I visited Ballast Point back in November. So, have you had this beer? If not, you need to remedy that. Especially if you're a fan of coffee and/or vanilla flavors. And Porter. And Beer. And being alive. There's your tagline. Victory at Sea: "If you like being alive, you like this beer". This week's User Beertography comes from ABROAD! 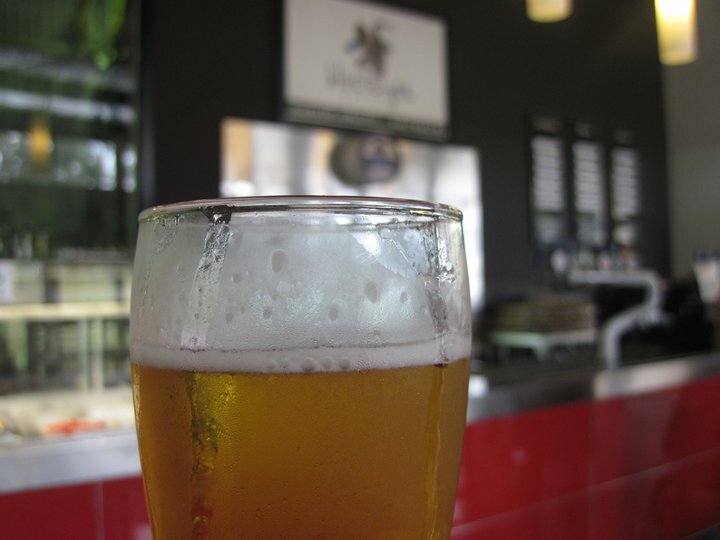 Mr. Chris Halbach recently visited the Blue Tongue Brewery in the Hunter Valley wine region outside Sydney. Unfortunately, according to Chris, the photo was much better than the beer itself. Apparently Aussies have a thing for ciders at the moment and for the most part aren't about drinking craft beer. This actually lead me to check out reviews of Australian breweries on beeradvocate and I couldn't find all that much in the way of stellar. What are the great breweries and beers in Australia? As always, keep those beer photos comin' to beertography@gmail.com. As a reminder, if you've already sent in your beertography, its still got a shot at making next week's post! Occasionally when I visit my parents in South Jersey, they like to surprise me by buying some beer to try "for that website of yours". Awesome. When it first started, it was a case of Michelob's faux-craft brands (which ended up taking a long time to plow through..not very good). Things have changed for the better though. Recently I've had Stone's Lukcy Basartd and Empirial IPA waiting for me. Then the other day I was surprised to find Sam Smith's Organic Lager. They picked it up because they're into the organic movement...and hey, organic + beer sounds perfect! This pours suuuuper clear and smells of cloves with a hint of banana. Its got a super light mouthfeel and I detect either Saaz or Noble hops. Mmm. A slight metallic finish. Nice head on it that recedes but never entirely. This brew has a decent malty-ness to it despite its low ABV. Very refreshing and strikes me as what Bud/Miller/Coors light lagers should strive for. Plus, its organic so that's a plus. Here in NYC, you can find it at a lot of bodegas. Next time you see it, get a bottle and let me know what you think! Recently, the epic BrewYork meetup raged on yet again and massive amounts of top-notch craft beer was consumed. In case you've forgotten, BrewYork is a collection of beer bloggers and industry pros in the NY/NJ area that seek to advance the gospel of craft beer. Too much good beer to fit in one photo. Mr. Charles Decker showing off his Surly Smoke. Matt & Bob opening a bottle. No big deal. You can't have a BrewYork without one mishap. Even if it doesn't involve a slingshot. Andy Zenyuch of River Crew Brewing Co. This week's fantastic shot comes to us courtesy of Josh Belisle of Wichita, Kansas. Above you'll see beers from Dogfish Head, Hopping Frog, Rogue, Avery, Coney Island, Paulaner, Mikkeller and Big Sky Brewing. As always, don't forget to click to embiggen/drool over. Thanks Josh! 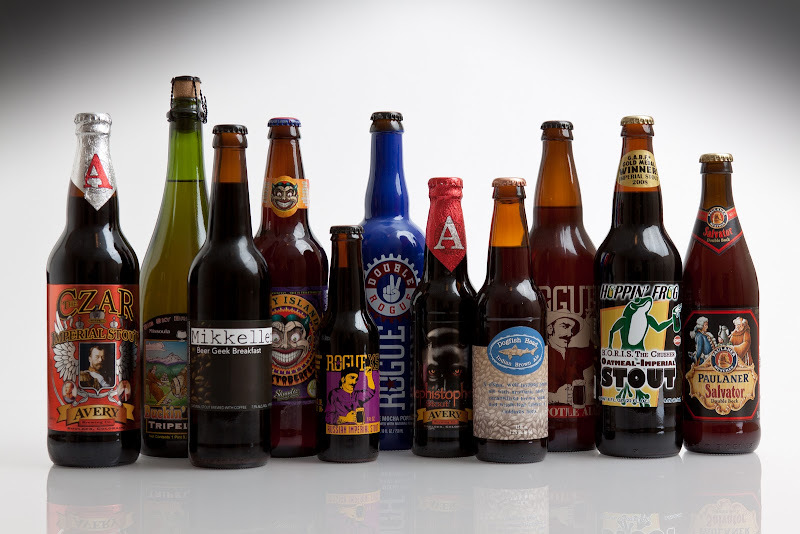 Got a great shot of beer or something beer-related? Send it in today and you could be featured next week!